There are many apocryphal stories about Chinese food, dating back to the dual fallacy that Marco Polo introduced ice cream and pasta to Europe – he didn’t. 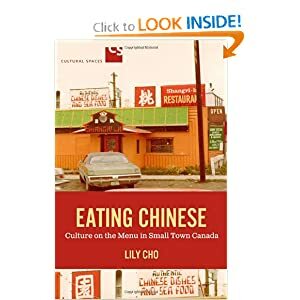 According to Lily Cho, the story of Chinese food is also the story of those moments where modernity stumbles, pausing for a moment to glance into a parallel world, not only of alien foodstuffs, but also of the great diaspora of Chinese emigrants. In a cheeky sense, her book Eating Chinese: Culture on the Menu in Small Town Canada presents it as the story of the Chinese discovery of the rest of the world, as coolies on the trans-Canadian railroad set up shop in obscure one-horse towns, serving food at first to their co-workers, and then to locals when the construction work carries on its way. Amazon has an aggressively negative review of Cho’s book, from a reader who seems to have been expecting a cookbook or a set of breathless anecdotes, and who balks at the level of high-falutin’ big words. But this is a disservice to Cho, whose book is actually far more approachable than the work of many other cultural theorists, offering a witty, perceptive analysis of a distinctly odd corner of Western culture – the seemingly ubiquitous small-town Chinese restaurant. In the process, she offers some illuminating stories about the history of Chinese food abroad, particularly such foreign interpolations as lemon chicken, sweet and sour pork, and chop suey. Cho is interested in the menus themselves, and what they tell Canadians about their own cuisine. There is, in a sense, no such thing as “Canadian” cuisine, until the day that a Chinese restaurateur added some Western dishes at the end of his menu for those diners who were afraid of “foreign food”. Cho uses the Chinese menu as a window into what was thought to be “Canadian” food over the last century. There is one odd mis-step, in which Cho dismisses as “urban myths” rumours of restaurants with one menu for Westerners and another for Chinese (p.36). This makes me wonder if her experience is not entirely limited to small-town Canada, as I have regularly asked for, received, and ordered from Chinese-only menus all over the world. In my experience, most restaurants have special menus for the use of Chinese patrons, although they are happy to provide them for anyone else who can read them. Jonathan Clements is the author of Marco Polo and Mannerheim: President, Soldier Spy.